A couple weekends ago, Connor and I went to visit his grandfather on his 100-acre farm just outside Buffalo, New York. It was a relaxing weekend full of swimming, reading, champagne cocktails, and just enjoying the outdoors—something which I haven’t done a lot of recently due to the crazy heat wave we’ve been having here on the East Coast. One of the most memorable parts, I must say, was devouring delicious, fresh, plump, warm-from-the-sun blueberries straight from the garden. 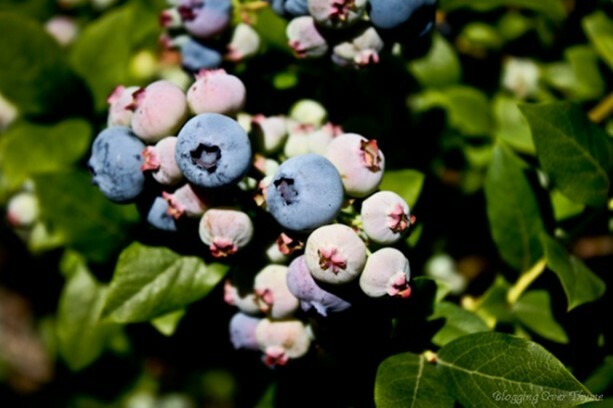 Even though I’ve had my share of blueberries over the summer, none of them have even come close in comparison. Pure deliciousness! Grease muffin pan.Using mixer, beat together apple sauce, butter, and sugar until light and fluffy. Proceed to mix in egg, yogurt, and zest one at a time until mixed thoroughly. In separate bowl, whisk together flours, baking powder, baking soda, and salt. Using spatula, fold in half of the flour mixture until comes together. Add in additional half and gently fold into batter. Batter will be very thick and dough-like. 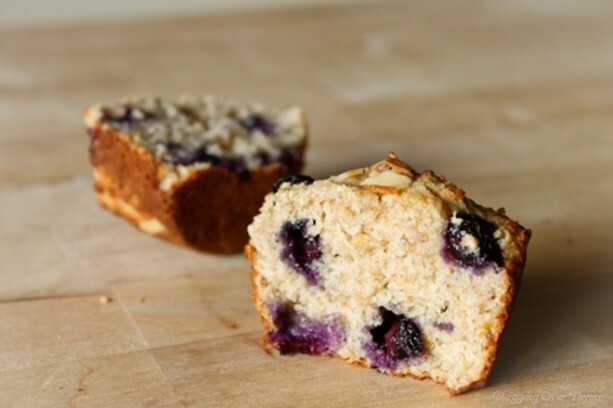 Add in fresh blueberries, gently folding in with spatula, being careful not to break the berries. Using spoon, fill muffin pan about 7/8 full. 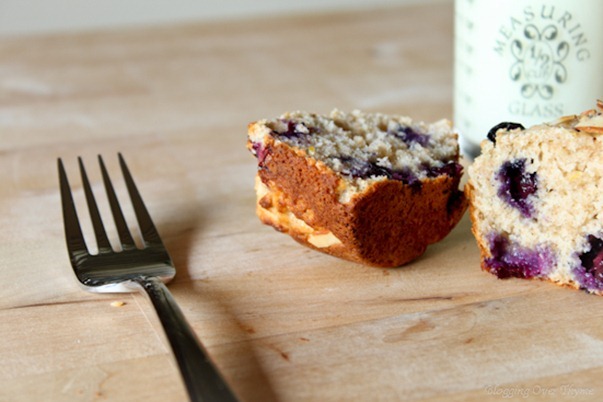 Sprinkle sliced almonds onto each muffin. Bake for 10-12 minutes (gas) or until golden brown and toothpick inserted comes clean. Cool on rack. Serve warm with butter. 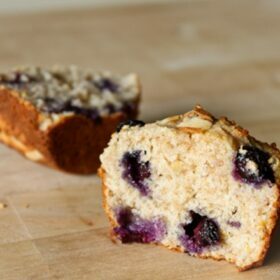 These muffins were exactly what I was hoping for and more—not too sweet, hearty from the whole wheat flour, juicy from the fresh blueberries, all with the added bonus of the slight crunch of almonds on top. The recipe also comes together incredibly quickly! 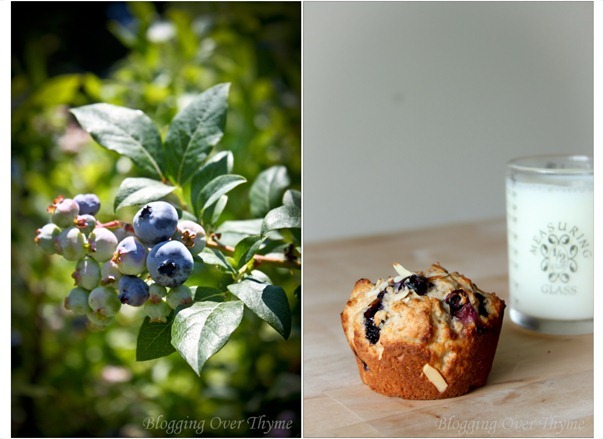 Although these muffins are best the day of, they will last for days and are particularly good when served warm.